Times 10 Publications, 9780986104909, 152pp. Want to solve your biggest problems tomorrow? You have problems, but you don't have time for a 5-year plan. You're tired of philosophy, research and piles of data. You want practical solutions that you can implement immediately. You don't need a committee or another meeting. You need Hackers-experienced educators who understand your school's problems and see quick fixes that may be so simple that they've been overlooked. Hacking Education is the book that every teacher, principal, parent, and education stakeholder has been waiting for--the one that actually solves problems. 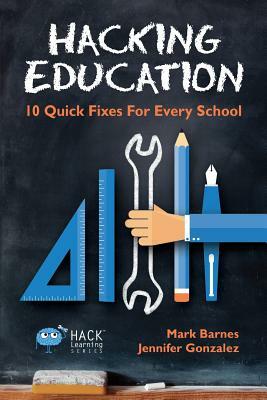 In Hacking Education, Mark Barnes and Jennifer Gonzalez employ decades of teaching experience and hundreds of discussions with education thought leaders, to show you how to find and hone the quick fixes that every school and classroom need. Using a Hacker's mentality, they provide one Aha moment after another with 10 Quick Fixes for Every School--solutions to everyday problems that any teacher or administrator can implement immediately. If you want to improve teaching and learning at your school now, learn how to develop a Hacker's mentality. Are you ready to fix your school and your classroom? Get Hacking Education now, and solve your biggest problems tomorrow.